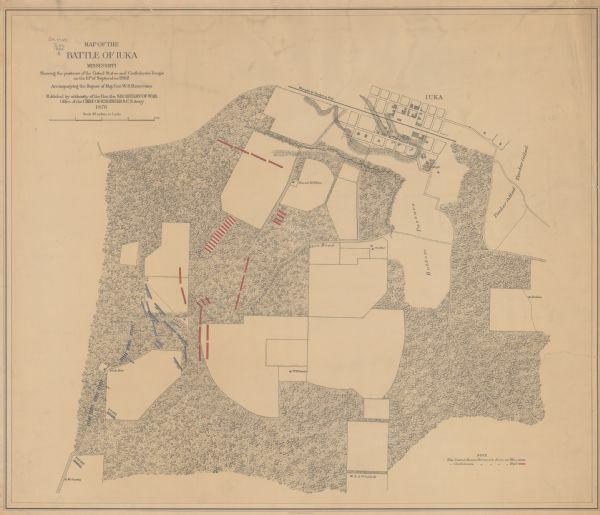 This map of the Battle of Iuka depicts the May 19, 1862, positions of the Union forces in blue and Confederate in red. Indicated on the map are roads, the "route to heights commanding Fulton Road" street pattern and buildings in Iuka, houses and names of residents in outlying areas, fences, "Memphis & Charleston R.R." vegetation, drainage, and relief by hachures. The 8th Wisconsin Infantry, 14th Wisconsin Infantry, and 16th Wisconsin Infantry regiments and the 8th Wisconsin Light Artillery and 12th Wisconsin Light Artillery batteries were present at Iuka but saw little or no action.